A week before my mother departed this life, I stopped in for a quick visit and to deliver her some food. She told me two of the other ladies in the apartment complex had gone to the hospital over the weekend with the flu; that it was a bad one. She said she was sure she also had it, but was feeling a little better that day. I looked at her and very matter of factly told her that I loved her, but she didn’t look good. She appeared to have lost quite a bit of weight since I had seen her two weeks prior and I was very concerned. It was a Monday and she told me she was scheduled for a doctor’s appointment on the Friday. This did little to alleviate the emotions that began crashing over me. I was running late for my class, so I hugged her. We exchanged greetings of love and I left. I cried on my way to class. No matter how much I tried to convince myself otherwise, I knew what was coming. The following Monday, I found myself having to make the most difficult decision of my life… to remove my mother from a ventilator. My mother went from being admitted to the hospital on Friday, for what was thought to be pneumonia, to finding out she was full of cancer and her body was shutting down. The experience was surreal and took place over a mere two-and-a-half days. And then it was over. Although I have siblings, I felt very alone. As the oldest and most responsible, all the decisions and arrangements fell to me. 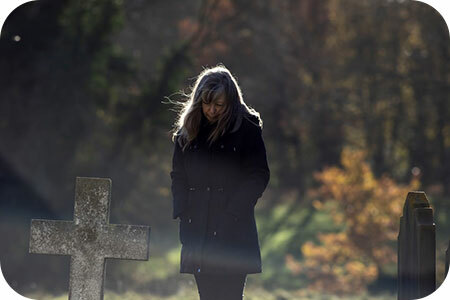 As a professional medium I help people with their grief from the loss of a loved one almost daily. Despite this my loss was overwhelming. I was grateful that my last conversation with my mother included the words, “I love you” – from both of us, and that I knew it to be fact. I was grateful that there were no real regrets in our relationship. And I was grateful that although her passing came much sooner than I anticipated, she also avoided a lengthy battle with a horrible disease. I was grateful for my faith, for my mother’s faith and for our shared belief in the eternal soul. Yet, even with all of this positive perspective, the realization that at 44 I now had no living grandparents or parents, was difficult to process. Yes, you did the math correctly, my mother was only 16 years older than me. She was a young mom, and at times she and I were more like siblings than mother and daughter, but I digress. The fact that I sensed what was wrong with my mother, a few weeks before her passing, yet I couldn’t do anything to fix it for her, bothered me. I also found myself struggling with the same grief I help others work through, and I became angry. For some reason, I felt I should be able to ‘be okay’ with all of it much sooner. Shouldn’t the mechanic be able to quickly and easily fix their own car? As a professional psychic medium, I am surrounded by colleagues in the same field who offered their support. All of my friends and family also offered their condolences. And while I deeply appreciated all of this, I still felt empty. My daughter ultimately offered me the words that started my healing. She said, “Mom, you always take care of everyone. It’s okay to not be okay right now.” Simple, yet powerful. It wasn’t about fixing what was wrong, it was about giving me the permission that I needed to be vulnerable for a while. It was in that space of ‘weakness’ that I was ultimately able to take the time I needed as a daughter to grieve my mother. If you have found yourself in a similar space, you know what I’m talking about. I think my daughter’s advice goes far beyond dealing with the death of my mother. I think we can all use those wise words from time to time. I’d like to give you permission to follow it when necessary. Whether it is because of the passing of a loved one, the end of a relationship, the loss of a job, or simply the end of a really hard week. Take the time you need to heal. No matter how strong you are, sometimes it’s okay to not be okay.